Electrical heat tracing (EHT) can overcome these challenges by keeping products at an optimal temperature, lowering viscosity and ensuring that they are easier to transport around the plant during the colder months. The term viscosity refers to the time it takes for an amount of product to run through a pipe. For example, water has a low viscosity as it flows more freely than honey. Liquids like honey and oil have a higher viscosity because they contain more complex molecular structures. Temperature can manipulate the viscosity of liquid. When the temperature drops, liquids like syrup develop a higher viscosity and become more difficult to pour. However, when it is heated, the molecules become more excited and begin to move which lead to lower viscosity. EHT lowers the viscosity of many processes as it acts as a compensating heat source to maintain or raise the heat in pipes, tanks, surfaces and other vessels. It effectively replaces the heat loss in the process and can therefore be used to prevent pipes from gelling or freezing, whilst maintaining the low viscosity of the process on plant equipment. Colder days and the resultant higher viscosity can also impact domestic water supply as well as the reliable drainage of rain and waste water leading to freeze damage and ultimately frozen and burst pipes. “To prevent freeze damage, electrical heat tracing can be installed on these pipes, preventing them from freezing without any additional insulation. A customised, self-regulating heat tracing solution is developed, installed and monitored to ensure pipes are warm enough throughout the winter months,” says Maynard. Brewing – maltose and dextrose. Throughout its history, EHT has been the safe choice for pipe and equipment heating as it can be regulated to deliver precise outputs. EHT essentially uses an electrical heating element that runs the length of a pipe; this heating element is then used to regulate temperature. EHT is recommended for use on both metallic and non-metallic, as well as lined piping and process equipment as it is equipped with controls to keep process temperatures within specific limits and conserve energy. “EHT systems offer a broad range of temperature options; it can be designed for applications with low freeze points right up to very high (800 -1000 degrees Celsius) process maintenance temperatures. It can also be installed on short or long pipelines which makes it ideal for large concentrated solar power (CSP) farms and petrochemical plants among many other applications,” explains Giles Maynard, General Manager at eltherm South Africa. Lastly, the common misconceptions that EHT can’t be installed in Ex areas is false. Just like steam tracing, EHT has seen major technological advancements allowing them to be installed anywhere. Steam heat tracing is a great solution in plants where steam is a by-product of various manufacturing techniques. 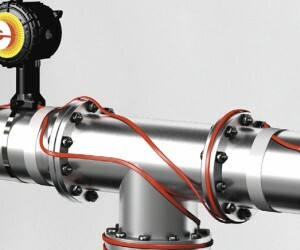 Simply put, steam heat tracing systems circulate steam around process pipes to heat them. The steam tracing is usually installed by running the steam lines in direct contact with the piping or vessels to be heated. The entire assembly is then insulated to direct the heat into the process fluid. Says Maynard: “One of the main benefits of steam is that it heats up quickly as the highest rate of heat transfer occurs when the difference between the steam tracing and the piping is the highest. This is particularly beneficial during a plant shutdown. From the above it’s very clear that both EHT and steam heat tracing play an important role in maintaining temperatures. However, EHT does offer less drawbacks and drives down operational expenditure (OPEX). “Steam heat tracing is quite cumbersome and time consuming to install and can’t be used on non-metallic pipes. Furthermore, it’s far more expensive to maintain as it make use of fittings which have a propensity to leak. Overall, steam heat tracing has a much higher OPEX. “Ultimately there is no cookie cutter solution, each system requiring heat tracing should be evaluated individually. There is no doubt that both EHT and steam heat tracing have an important role to play in the different environments and industries they are developed and designed for. The key is to do proper homework, consult with the experts and install a system that will future proof your investment,” he concludes.